Sony Xperia XZ2 Premium size comparison: this is the biggest phone of 2018! The Sony Xperia XZ2 Premium is a unique phone with a stand-out 4K 5.8" 4K 2160 x 3840 pixel screen, a top-tier Snapdragon 845 system chip, a very good camera, but it is also a huge device, bigger than most other phones out there. In fact, the Sony Xperia XZ2 Premium is the BIGGEST flagship phone launched in 2018! It's not only that the phone is rather thick with a thickness reaching up to 0.47 inches (while others hover around the 0.3-inch mark), it is also physically gigantic: it is tall and especially wide, which makes it very hard to handle with one hand. 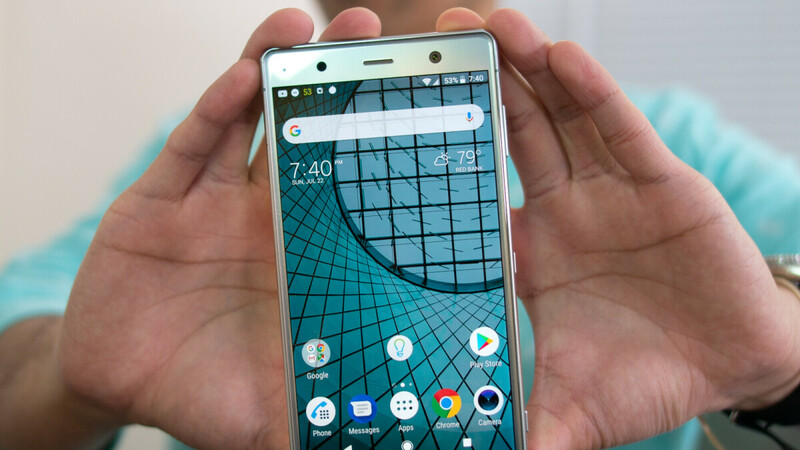 The Xperia XZ2 Premium is bigger than all earlier top-tier Sony phones and it is significantly larger than even the already big first-get Xperia XZ Premium. The Samsung Galaxy Note 8 is one of the biggest phones around, but even the Note 8 is not as wide as the Xperia XZ2 Premium (the Note is a bit taller, though). The Galaxy S9+ looks plain tiny in comparison with the Sony! Apple's gigantic iPhone 8 Plus is about the same size as the Xperia XZ2 Premium, but it is much thinner, while the Sony is a thick, bulky phone. And most other phones don't match with the excessively giant Xperia XZ2 Premium. Would carrying such a big phone be uncomfortable to you? And would you buy the Xperia XZ2 Premium despite its large size? The iPhone 8 plus is physically taller than the XZ2 premium. Yeah, but 5.2mm narrower and 3.3mm thinner. It's crazy how tall the Note 8 is. But the screen of the XZ2 Premium is 16:9 instead of 18:9, so both screen surface and content size is bigger on the XZ2 Premium. Definitely bigger than on S9+ but maybe also bigger or just as big as on the Note 8. This is something that the article doesn't mention; the XZ2 Premium is no champion in space usage, but it actually has a bigger screen than most of the other phones in comparison. Smaller diagonal but actually bigger surface and content display. This partially explains the dimensions. The Mate 10 has a bigger screen and also uses 16:9 aspect ratio, yet it is a lotttt lot shorter, narrower, and lighter than this brick of a phone. Stop with the excuses ffs. Bigger is not about width only, it is about how tall is a phone. The Note 8 is 162 mm tall, and that is too big for a lot of people. The XZ2 Premium is too heavy! For God's sake are they out of mind? Damn, that's enormous. My phone has a similar sized 5.7 screen and external body dimensions of 141.5 x 71.1 x 7.8 mm. It's (XZ premium) like a paper back book ffs, huge pass. Edit; mine has titanium frame (185g) and weighs in 50 grams lighter then this premium XZ phone at 235g. Again wtf lol. I honestly can't believe that they're selling this monstrosity as a flagship in 2018, let alone at the absolutely bonkers price of $999. They could mark it down by 50% and you'd still be getting ripped off. How do you wirelessly charge a curved back smartphone on a flat receiver? That thing could roll when using it while charging on a wireless charging dock.